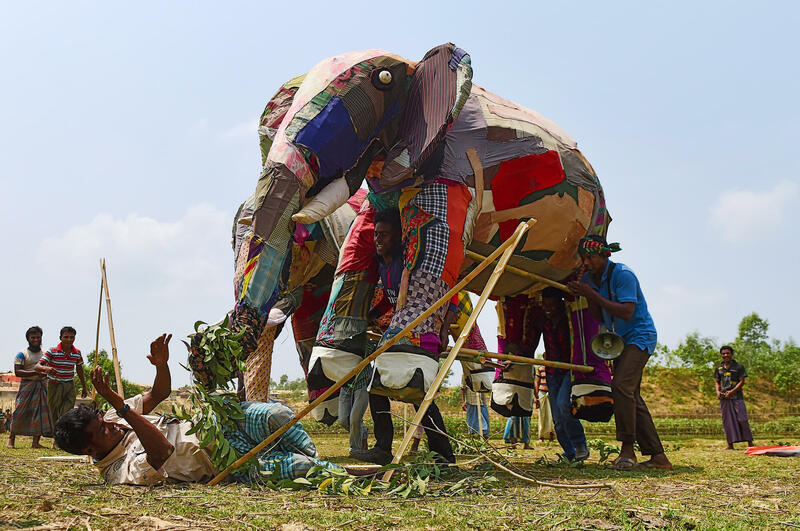 Rohingya refugees use a mock elephant during a training session on how to respond to elephant incursions at the Kutupalong refugee camp. The massive refugee camp sits in what used to be a migratory path for elephants moving between Myanmar and Bangladesh. Foyes Ullah's first thought was — burglars! It was 2 in the morning in a densely crowded part of the Kutupalong refugee camp in Bangladesh, and a commotion had just jolted him awake. People outside were yelling. The walls of his shelter were trembling. He could hear bamboo snapping as if someone were ripping apart a neighboring hut. His neighbor was screaming, "Who is hitting my house? Who is there? But no one was responding," Ullah says. He wanted to go outside but his wife stopped him, saying, "They will kill you." It sounded as if the whole neighborhood had woken up. People were yelling, "There are robbers!" Then Ullah heard a sound – "EEEK." And he knew it was an elephant. 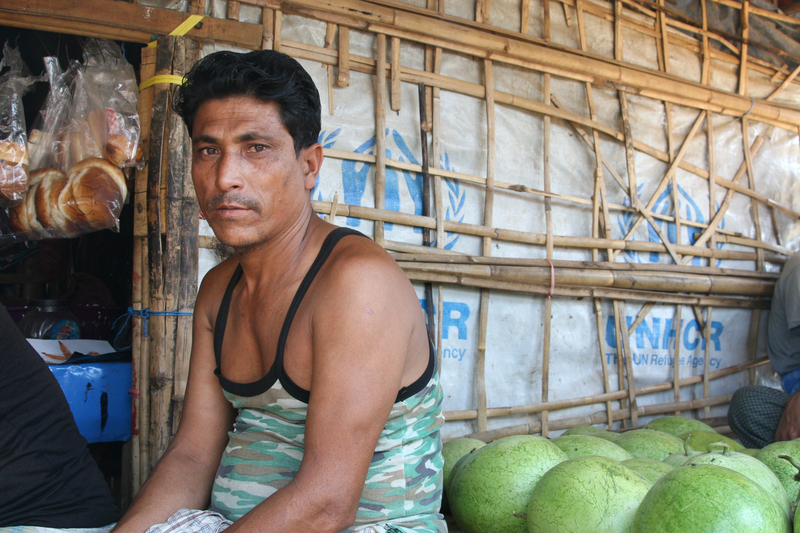 When Rohingya refugee Foyes Ullah heard noises one night, he first thought robbers were tearing at the walls of his shelter. It was actually an elephant. When Ullah finally came outside, he says the elephant was knocking down everything in the camp, including shelters made of tarps and woven bamboo mats tied to bamboo frames. The elephant had plowed through several huts and was eating from a pot of rice that it had spilled over. "One of the men here saw the elephant," Ullah says. "He pulled the tail of the elephant, and the elephant just turned and went away. It was then that Ullah discovered that the elephant had stepped on his neighbor's chest, killing him. Ullah's neighbor was one of 14 people, all but one of them refugees, who've been killed by elephants over the last year and a half in and around the camps. The most recent fatality was in February. An Asian elephant in Bangladesh. The males can weigh up to 12,000 pounds. Asian elephants can weigh up 12,000 pounds. The International Union for Conservation of Nature lists the species as endangered. In Bangladesh, there are only a few hundred left in a couple of areas in the wild. And one of those areas is exactly where hundreds of thousands of Rohingya are now taking shelter in sprawling refugee camps. Late in 2017 nearly 700,000 Rohingya fled Myanmar to escape brutal attacks by government security forces and pro-government militias. To deal with the elephant problem, the U.N. refugee agency, UNHCR, has helped set up elephant response brigades among the refugees. "We are not traditionally an organization that gets involved in conservation," says Paul McCallion, a senior energy and environment officer working out of the UNHCR office in Cox's Bazar, Bangladesh. "We are involved with the elephants here simply due to the fact that their migratory path has been cut off with the influx of refugees." The elephants end up in the camps, McCallion says, because they're instinctively trying to follow a path they've taken in the past. "It's just in their DNA and they will keep naturally trying to take that route." He says the elephants travel each year back and forth between Myanmar and Bangladesh foraging on local vegetation. But as the Rohingya refugee camps have expanded, the settlements have taken over areas where the elephants used to graze and blocked them from getting to other grazing spots. "The elephant can feel trapped. It can feel confused once it's behind the shelters. The danger is when the elephant ends up in the midst of a camp and doesn't know how to get out. That's when it gets to a stage where the animal could react in a very aggressive way." The main goal of the elephant response teams is to keep the animals out of the camps in the first place. Dotted around the camps are tall, thatched watchtowers on spindly bamboo frames. They look like fire lookouts or guard towers. 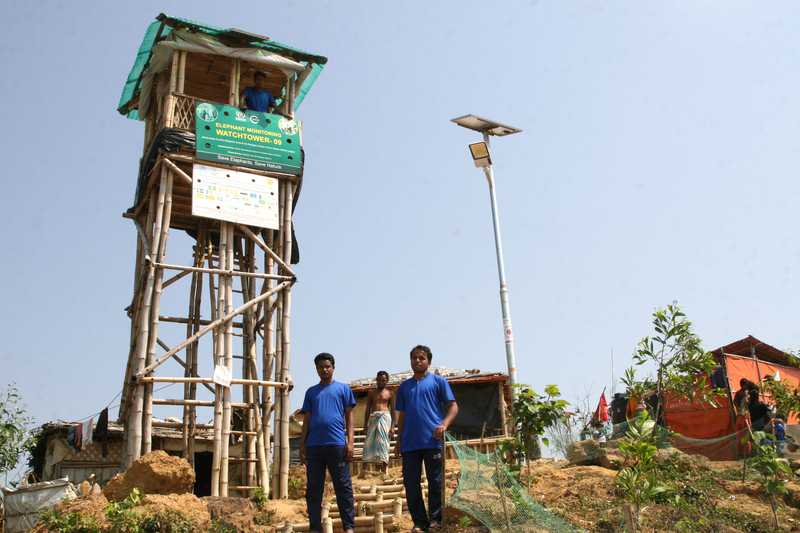 The U.N. constructed this elephant watch tower in the Kutupalong refugee camp in Bangladesh so residents can keep a lookout. Noor Salam, who's 33, is with the elephant response team in an area known as Camp 4 Extension. He is dressed in the official uniform of what UNHCR officials call the "Tusk Force" — a blue t-shirt and dark track suit bottoms. He says the towers are used to watch for elephants that might be approaching the settlement. If an elephant does enter the camp Salam and his colleagues use whistles to summon more members of the team. "In the training we were taught to surround the elephant on three sides," Salam says. "We leave one area open for the elephant to move back toward the edge of the camp." The team members wave fluorescent flags and blast sirens from hand-held megaphones at the elephants to drive them away. At night they shine large lights while making lots of noise. Salam says before the response teams were formed, the refugees would yell at the elephants and bang pots to drive them away but it was often chaotic. The noise and the commotion would often upset the elephants even more. And it didn't keep them away. "This is the elephant's land," Salam says. "They're going to keep coming back here." But the response teams have been effective. Since Noor's team was formed in Camp 4 Extension last year there haven't been any fatal elephant incursions in to his part of the camp.